Ladders come in all shapes and sizes; and much like safety boots, the proper equipment for the job is vital. If you’ve worked any hands-on profession long enough you’ve been on a ladder and you’ve probably experienced or witnessed a not-so-safe, scary moment with a co-worker or employee - maybe even a fall. According to the US Bureau of Labor Statistics, ladder falls accounted for 30 percent of disabling workplace falls from a height in 2011. OSHA accounts that falls are a leading cause of death in construction every year and that falls from ladders make up nearly a third of those. So it’s important to know the major causes of most ladder falls and what you can do to help yourself and others avoid injury and stay safe when using any type of ladder. The above are pretty basic and probably didn't surprise you. Why? Cause they're common sense. But since accidents are still happening workers must be thinking it's not going to happen to them - and that's probably cause it hasn't happened YET. But bad practices eventually lead to injury so it's best to learn, instruct and enforce the correct way for using this commonly used vital piece of equipment. Always wear proper footwear that is best suited for ladders. 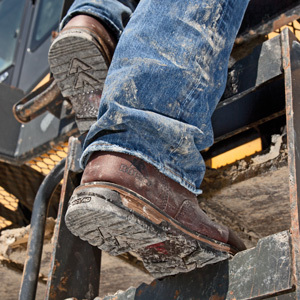 The best boots for ladders have a debris-releasing, anti-slip outsole with a right-angled heel that is at least a half-inch in height for proper rung gripping when standing for a long period. 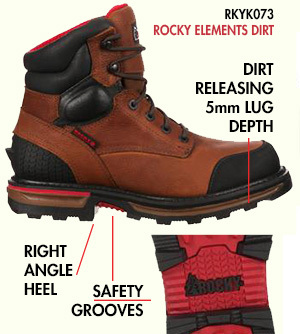 Specific outsole styles have embedded safety grooves in the arch area for added gripping traction - examples of these would be the Rocky Elements, Timberland PRO Helix, Vibram Twister and Rocky Ride. See Figure 1. An internal shank for rigidity in the arch area to avoid too much flexing will help provide longer-lasting comfort. Always check the soles of your shoes to make sure they are clean before climbing. Never wear open–toed shoes or sandals. Know your work environment and choose the best ladder material (wood, fiberglass, metal) height, and type (step, single, extension, combination, articulated, mobile, etc.) for the job. Inspect all ladders before use for damage or missing parts. Do not use a damaged ladder. Always check the Duty Rating sticker on the side of the ladder for the maximum weight capacity. When figuring load be sure to include all equipment, tools and extra clothing you will be wearing (never carrying). See Figure 2. 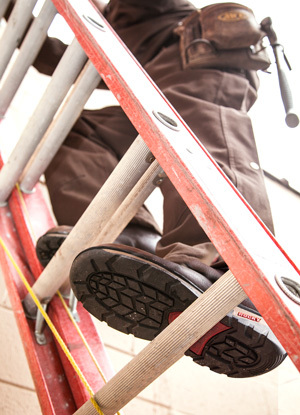 Make sure your ladder is on a solid, level, non-slippery surface. If the ground is not solid or level, adjust the ladder feet so the ladder can’t slip or move and is stable with level rungs. If that is not enough there are several ladder-leveling accessories you can buy. If adding any boards under low side of ladder make sure they are wide enough to not tip - if possible it is better to dig out from under the high side to a trench the ladder foot can sit in. See Figure 3. Angle is important when using extension and single ladders that lean against a wall. The bottom should be positioned at one-quarter of its length away from the wall. So if your ladder is extended 10 feet, the base should sit 2.5 feet from the wall. This should make a right angle with the wall and ground. You can also simply gage this by facing the standing ladder with your toes touching the ladder feet and reaching your arms out toward the rungs. If you can touch the ladder with your fingertips, the angle is good. See Figure 3. Make sure the ladder you are going to use is tall enough to reach your work area. You should never stand on the top rung. For leaning ladders, the top should extend a minimum of 3 feet above the point of support. See Figure 3. Stay clutter-free around the bottom and top of the ladder by not setting buckets or tools close by so that you have plenty of free space to dismount. See Figure 3. Use the 3-points-of-contact method. At all times you should have either two hands and one foot or one hand and two feet in contact with the ladder. You should also keep hands on the rungs of the ladder, not the sides, for a more secure grip. If working around electrical wires or equipment, use a ladder with non-conductive side rails and always stay at least 10 feet away from power lines. If using a ladder near a doorway, make sure to close and lock the door or use a barrier of some sort (cones) to avoid getting knocked into or over. 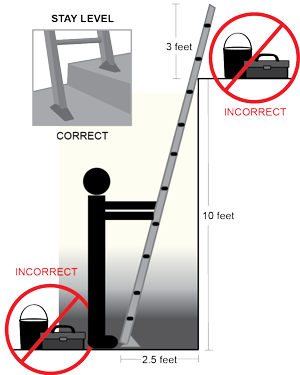 Always face and lean into the ladder keeping your weight centered between the side rails. Never overreach or lean to the side - keep your belt buckle between the side rails. If you can't reach an area without shifting your weight from center you need to move the ladder. Do not carry heavy equipment or tools in your hands. Never use a ladder in high winds or storms. Never use a ladder if you are not feeling well and prone to dizziness or instability. Always read and follow the manufacture’s usage instructions. Make sure the ladder you are using meets ANSI A14 standards. For more information and training on ladder safety visit the American Ladder Institute website.